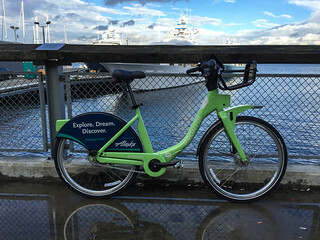 I tried out our new bike share service in Seattle. 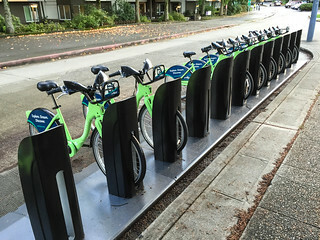 It’s called Pronto, and has dropped a fair amount of bikes – 500 at 50 stations throughout the downtown, Capitol Hill, and U-District areas. I noticed a station that’s about 2 miles from my home on my commute home last night, so after getting a ride in this morning, I opted to try Pronto for the commute home. My expectations were that it would be a better substitute for a crowded bus ride home. I purchased a 24-hr pass with a key for ten-bucks at the kiosk a couple blocks from my office. I didn’t need to “rent” a helmet as I brought mine with. After inserting the key in a station and waiting for something to happen, I thought my key was broken. I tried another bike, and it unlocked right away. I forgot my foolproof way to raise the seat to the proper height (seat in armpit raised until outstretched middle finger is at center of crank), so I ended up raising it a few times in the first few minutes. 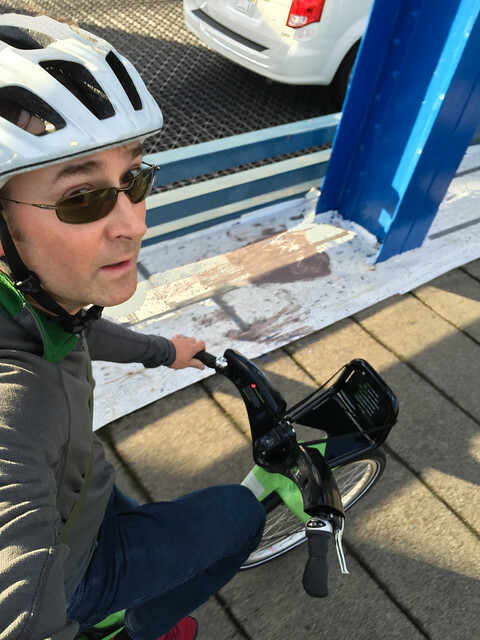 Starting up the new 2nd Ave bike lane, I weaved my way through the city taking the “flat” way home via south Lake Union, riding through the parking lots along the lakefront. After crossing the Fremont bridge, I continued on the Burke Gilman trail along the north lakefront, and rode through the UW campus before dropping the bike off at the UD-01 station at Blakely and 24th. Ironically, the first station I tried to lock my bike back into didn’t work, so I docked it in another one which accepted it immediately. Some gremlins to work out? The bike is small, so it would work really well for someone in the lower 5′ range. I had to boost up my seat quite a bit to avoid the bent-knees, low power pedal stroke. The bars felt really close, so I felt like I was riding a kid’s bike compared to what I’m used to. That said, I generally ride a big bike in a fairly stretched out position, so most folks would feel that it is sized just fine. The bike is solid and sturdy, but not too heavy. It has a 7 speed range, and shifts are fast and solid. Shifting to a lower gear is sudden, and I popped my foot off the pedal several times getting used to the shifting. In the highest gear, I was traveling about 15-17mph on flats with normal cadence. Not a speedster, but not bad. I never used the lowest gears. It is really stiff, and the tires are of the sturdy type – great for folks up to 300lbs, at least. Fenders work – could use a flap, but adequate and appreciated for the few puddles I went through. Lights! Didn’t really need to use them, but great that they are there. It has a skirt/kilt guard for the ladies and Scots! There is a small bungie and rack for a small bag or case. I just carried my musette. No problems if you have a bit of luggage. The seat was not great for someone of my size – too squishy, smallish, and angled for folks that are smaller. The cost structure is not yet ideal for someone who needs the bike for more than ½ hour. Buying the day pass gave me unlimited rides up to 30-minutes, but anything over 30 minutes adds charges. My 45 minute ride cost me an additional 2 bucks. All gripes aside – these bikes are great for the casual tourist, or someone who wants to take the long way home like me on occasion. I would also use this to get to a lunch spot that may be a bit too far for a walk. Pretty nice to have an easy option to “rent a bike” and there are stations all over the place. I could also see someone stuck on foot choosing this as a faster option. It took me from downtown to the UW in about 45 minutes. It’s nice to have options when I don’t have my bike handy. I will likely resort to this in the future.